Nestled between the Atlantic Ocean and the Spanish Pyrénées in the South-West of France is the Pays Basque and it has a much respected culinary style all of its own! As an appetizer, you can’t beat a few slithers of jambon de Bayonne, a delicacy on every menu in these parts – at Michelin starred restaurants and bistros alike. You will also see it hung up in shops and offered up as tasters at the markets. It is made in villages around the Adour river basin and has been celebrated during Holy Week for the last 500 years. Part of what makes it so distinctive is the salt used to conserve it, the qualities of which were discovered by chance. In this case, a boar that fell into a saline spring at Salies de Bearn emerged perfectly preserved. Locally sourced fish is another fixture and well paired with white wine from Jurançon, the combination of peach, pear, white flowers, vanilla and honey is perfect with shellfish and trout. It has been made here, where Béarn meets the Pyrénées, since the 16th century. 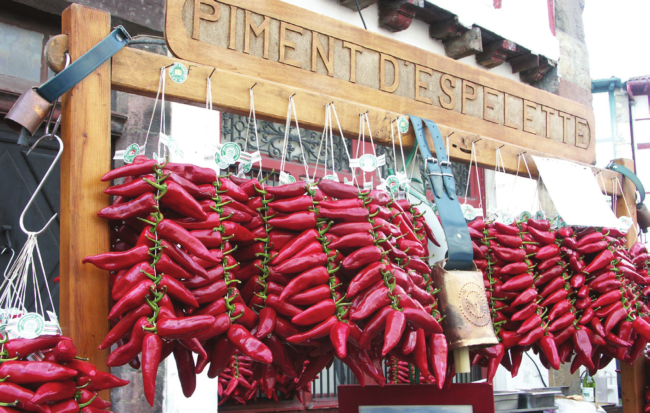 Other dishes are improved with the addition of another ingredient native to the Pays Basque – the piment d’Espelette. For cooking it is transformed into a chilli powder for use in le poulet Basquaise (chicken in a spicy red sauce), la garbure (a thick cabbage soup with ham) and la poule au pot (chicken casserole) though the long red peppers are commonly dried and used as decoration in the home too. What sets the (AOC certified) piment d’Espelette apart from other chillies you may have tried is its delicate balance between fruity and smoky, aroma and spice. For this reason it is considered the ‘king of all spices’ in the Pays Basque. Before moving on to dessert, you must find some room for cheese! From the Pyrénées comes a ewes’ milk cheese that first made its appearance an incredible 3,000 years ago. You can taste it any day of the week at a farm or market stall. As far as dessert, there is one very obvious choice… the gâteau Basque, which incorporates black cherries and cream – how could anyone resist such a temptation? From pâtisseries to boulangeries and grocery stores, you will only ever be a few steps away from one of these mouth-watering cakes. But wait, it gets better. If you are one of those people who can always find room for a little piece of chocolate after dinner, then the Pays Basque presents the perfect excuse! Back in the 15th century, cacao made its way into France via Bayonne, now home to a community of chocoholics. The city has museums, galleries and even chocolate factories (some with chocolate making workshops!) open to visitors. 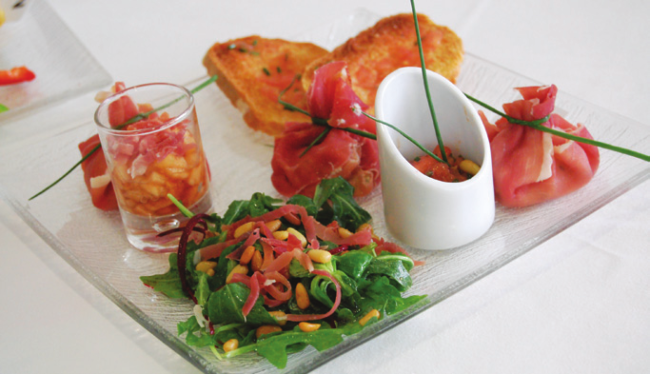 From seafood restaurants to market stalls, via Michelin stars and gastronomic fairs, food from the Pays Basque is to be savoured in all seasons.